Rikhotso was the winner of the prestigious Brett Kebble Award for 2004, an honour that he shared with Tanya Poole from Grahamstown. His career dates back to the early 1980s. He hails from the Limpopo Province where he was born in 1945 to Shangaan parents. Limpopo is a province possessing some of South Africa’s best artists working in the sculptural idiom. His aptitude for carving combines an ancestral influence that directs the artist in conceptual aspects through dreams. This is coupled with a unique personal vision and a technical skill learned from his grandfather who was a carver. In 1971 Rikhotso abandoned his artistic pursuits for the mines in Johannesburg and later tended roses at Westpark Cemetery in 1977. 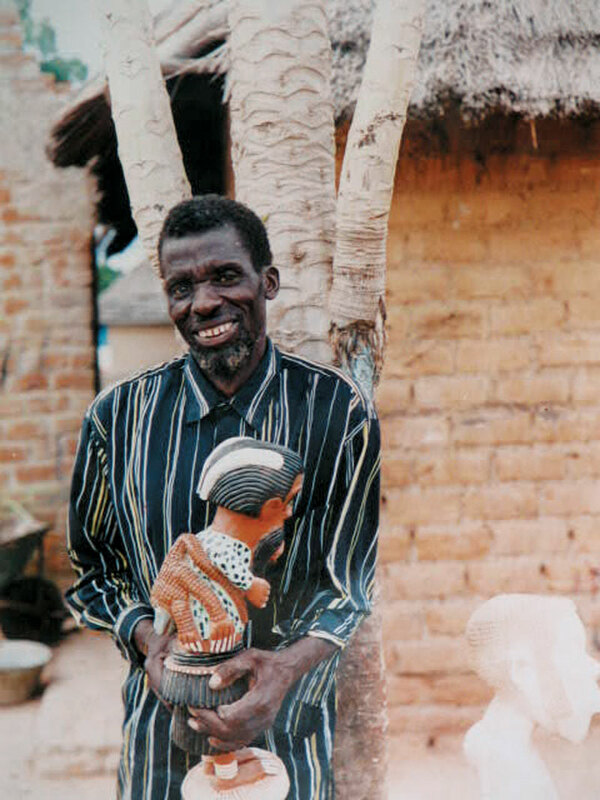 He then returned to Giyani because of ill health and resumed woodcarving with renewed zest. Rikhotso is influenced by a past both imagined and real. His cartoonish wooden-spirited figures bare the mysterious and the unknown, and refer to tales of witches and other myths. He believes that there was a time when people had greater spiritual powers, but with the infiltration of popular media culture this power was lost to most. Remarkably, his work projects a kind of pop-culture appeal, which is a surprising element since he neither has nor watches any television and never visits the cinema. His fantasy figures, drawn from Tsonga myths and legends, contain powerful symbols of magic. Born Giyani, 1945. Training Self-taught as an artist. Exhibitions 1993: Solo Exhibition, Everard Read Gallery, Johannesburg. 1995: No Limits, No Frontiers, Johannesburg Biennale. 2000: Hayani/Crossings, NSA Gallery, Durban. 2004: Brett Kebble Awards Exhibition, Cape Town International Convention Centre, Cape Town. Collections Iziko South African National Gallery. Photograph of Philip Rikhotso. Courtesy of Monna Makoena, Gallery Momo, Johannesburg.